The Bills moved to 5-2 straight-up on the year following Sunday’s impressive 34-14 victory at home against Oakland as slight 1.5-point favorites on closing line. This boosted their record against the spread to 4-1-2 and the total has gone OVER in three of their last five games. Buffalo is just a half game in back of New England in the AFC East as one of the more surprising teams this season. It has gone 2-0-1 ATS closing as a favorite this year. Buffalo’s offense is ranked 25th in the NFL in total yards per game, but it jumps to 15th in scoring with an average of 21.9 points per game. Fueled by LeSean McCoy and a ground game that is ranked ninth in yards per game (124.6), the Bills rolled up 166 rushing yards on 37 carries in Sunday’s win. McCoy did most of the damage with 151 yards rushing and a score. Buffalo’s defense is now third in the league in points allowed (16.4). The Jets have played better than their SU 3-5 record, but the tough losses keep piling up following a promising 3-2 start. They have lost their last three games to New England at home, Miami on the road and Atlanta at home by a combined 15 points. New York is a profitable 5-2-1 ATS and the total has gone OVER in three of its last five games. 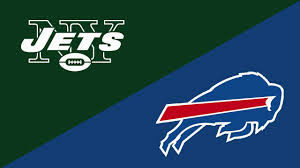 Josh McCown continues to run the Jets’ offense as the starting quarterback and in last Sunday’s five-point loss to Atlanta as 6.5-point home underdogs he completed 26 of his 33 passing attempts for 257 yards and two score against zero interceptions. New York only managed to gain 43 yards on the ground as part of a rushing offense that is 23rd in the league with 95.8 yards per game. New York’s defense is 26th in the NFL in total yards allowed and 22nd in points allowed (23.2).